We typically recommend that you save 15% of your take-home pay each year. Money in the bank isn’t compounding. Invest the money in an age-appropriate portfolio and rebalance regularly. Make sure your investments choices have low fees and expenses. Assuming you start at age 25, you should have sufficient assets to retire at age 65 after 40 years. Short-term market volatility should not deter long-term investing. 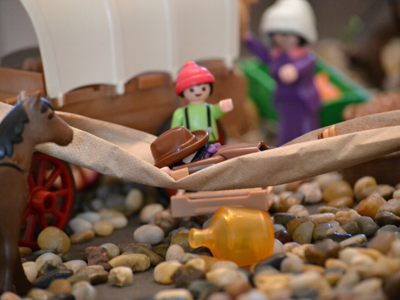 Retirement planning is like the pioneers who set forth on the Oregon Trail. The hardy souls who began their journey in early spring had to average 15 miles a day to reach their goal. But those who delayed until summer needed to maintain a faster pace. The same is true of saving for retirement. Beginning at age 25 and retiring at 65, the appropriate savings rate is 15.4%. But starting just five years earlier, you could reach the same goal by saving just 11.1% each year. Starting early is more important than saving more. If you start at age 20, you will have saved nearly an entire year’s salary by the time the couple delaying is putting in their first 15%. In fact, the family starting earlier will be ahead of the family starting later all the way up until age 65. This is true even though they will be saving 5.3% less of their salary each year. Deferred consumption is the definition of capital. When a family defers consuming and saves and invests instead, they put that capital to work. Having more money invested early means their investments are making money and adding to their savings, which reduces the amount they need to add. Money makes money. Starting at age 15 is even better. For students who work summers and start saving, the safe lifetime savings rate is only 8.04%. Starting early is so beneficial that you can lower the rate you need to save each year. Thus every sage investor suggests beginning as young as possible. Late April or early May was the best time of year to set begin the arduous trek to the West. If you waited too long, you would have to push farther each day or risk getting trapped in the mountains by an early snowstorm. The same is true of retirement planning. The later you start in life, the higher the percentage of your lifestyle you must save. Starting at age 25 you should save 15.4% of your lifestyle each year to reach financial independence by age 65. For every year you delay, add about 1% in your 20s and 2% in your 30s. Here’s one of my favorite math problems: If a wagon train averages 10 miles a day for the first half of the Oregon Trail, how fast does it have to travel the second half to average 20 miles a day for the entire journey? Most people wrongly answer 30 miles a day. But if the trail is 2,000 miles long, to average 20 miles a day you would have to travel the entire trail in 100 days. But if you averaged 10 miles a day traveling the first 1,000 miles, you would have already used up 100 days. You would then have to travel the second thousand miles instantly to overcome your slow start. Starting at age 30, we suggest you save 21.4% each year. By age 35 it rises to 30.1%. And at age 40 it is 43.2%. Saving half your salary is difficult at any age. Lowering your standard of living to begin saving at age 40 is even more challenging. By age 45 the percentage rises to 64.2%, and at age 50, you must save 100% of your lifestyle to reach retirement at age 65. Saving 100% of your lifestyle sounds impossible, but it is not. If you earn $100,000 after taxes, you must limit your lifestyle to $50,000 and save the remainder. This strategy will allow you to retire at age 65 with a lifestyle of $50,000. Changing your lifestyle by spending less and saving more is always the fastest way to catch up from a slow start. Most important, it reduces the amount you must save to reach financial independence. Lowering your lifestyle is like traveling twice as fast and cutting half the distance you need to reach your destination. Social Security can also provide a larger percentage of your retirement. If you are willing to retire on an average monthly income of $1,230, you probably don’t need to save at all. But that certainly is not what any financial planner would recommend. Start early and enjoy a more leisurely trip. But if you have delayed, don’t give up. Make a commitment to adjust your lifestyle as needed. For clarification: If I have an employer match of 100% up to 5% of my income for my 401k, and I contribute 5%, does that mean I have contributed 10% according to this math? So basically, if I put in $100, they put in $100 if it’s 5% of my salary that period. I’m 25 and trying the best I can, because I have a lot of student loans, new home mortgage, a wedding I’m planning for, etc. The short answer is “Yes, if you contribute 5% of your salary to your 401k and your employer contributes 5% to your 401k you are contributing 10% of your salary to your 401k. The long answer gets complicated because savings are measured in standard of living units (let’s call them SOLs) which are how much AFTER tax money you actually need to live. If you earn $60,000 but only spend $40,000 your SOL is only $40,000. If you save 5% of your $60,000 (which is $3,000) and your employer matches it with another 5% of your salary (or another $3,000) you are saving a total of $6,000. Now $6,000 looks like 15% of a $40,000 lifestyle, but not exactly. The money you contribute to a traditional IRA or 401k is not completely yours. In retirement the government will probably collect some percentage of it, let’s estimate 30%. That means your $6,000 contribution is really $1,800 the government’s and $4,200 yours. Hence your contribution of $6,000 before tax dollars (about $4,200 after tax) on a salary of $60,000 (which is only a standard of living of $40,000) is a 10.5% contribution ($4,200 / $40,000 = 0.105 or 10.5%). This translation between before and after tax dollars gets a little complex. But it is important to recognize that a $100,000 in a traditional IRA or 401k is worth the same as about $70,000 in a Roth IRA or Roth 401k. When computing retirement progress we translate everything back into after tax dollars. This post was selected for the Tour de Personal Finance contest. Fans of Marotta On Money pedaled it on to the next leg of the race by voting for it before July 8th, 2013. Green Jersey – Goes to the blog whose article wins a single stage “the fastest.” In other words, the Green Jersey goes to the blog who wins a single stage by the biggest margin against their competitor.